„Cross core integration” is a fundamental concept in yoga and martial arts and describes the kinetic relationship between the trunk („core”) of the body and the limbs / extremities. It is based on the concept of kinetic chains, which refers to the interconnection of bones, joints and muscles, building more complex body parts such as arms and legs. If the last link in a chain can move freely, like a free hand, then this interconnection is called an „open chain”, as opposed to a „closed chain”, defined as a posture in which one part of the body is fixed, e. g. a hand touching a wall or the floor or holding another body part, as in the case of a standing balancing pose on one leg with one foot supported by a hand. From a kinetic viewpoint, our core plays an important role by transferring energy between the lower and upper extremities. While standing on our feet, one or both of your arms might be in an open chain. Keeping the arms upward requires a solid foundation. Thus, energy will flow through the core and the lower extremities into the ground. Even if we are upside down in an arm balance pose, the core always remains in the middle, transferring the force. The legs are the foundation in standing positions. The angle in the front knee and the extension of the rear leg as well as the orientation of the hips define the height of the pelvis relative to ground. An equal weight balance, with feet hip distance apart, provides a solid base. The pelvis connects the legs to the core and must tilt upright in order to raise the trunk. Sometimes the hip flexor of the rear leg will limit the pelvis’ range of motion, which requires an adjustment by shortening the stance. Just like the pelvis and the legs, the shoulders connect the arms to the core. The musculus serratus anterior is especially responsible for that attachment, therefore it is important to engage these muscles prior to rising the arms in an open chain. 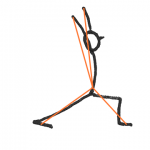 Visualizing the line of power, beginning with the feet, crossing the core and reaching up to the hand, looks like a cross „X”. That is why we call it „cross core”. Understanding this relationship is crucial to consciously building up yoga poses section by section from ground to top, which is called „cross core integration”. This is the basis for strength and ease (sk. : sthira and sukha) in yoga practice.